Los Angeles - Portland Maine’s Kurt Baker from The Leftovers embarks on a new solo career with his first original material since the release of his group’s Crappy Records/Oglio debut, “Eager To Please”. 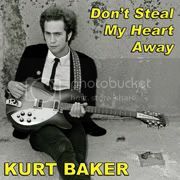 Kurt’s new track “Don’t Steal My Heart Away” is available now at all digital retailers as well as special fans only versions at his Facebook and Wordpress pages. This is the first single from his upcoming solo album of all new material, due later in 2011 on Crappy Records/Oglio Records, a Fontana/Universal distributed label. The new single was produced by John Wyman (also produced The Leftovers first ever release) at Portland’s legendary The Halo studio and features Geoff Useless, Craig Sala, Kris “Fingers” Rodgers, Josh Malia and a killer lead guitar solo that channels The Shirelles “Will You Still Love Me Tomorrow”, thanks to guitar monster Miek Rodrigue. “Don’t Steal My Heart Away” is the follow up release to Kurt’s cover of The Nerves “Hanging On The Telephone” from his Got It Covered EP, a side venture in fun 80’s power pop influences. “Hanging On The Telephone” is available as a seven inch vinyl 45. Catch the new Kurt Baker Band at the Paul Collins presents Power-Pop-A-Licious Fest at Asbury Lanes, Asbury Park NY beginning on April 30, 2011.